Palestinian President Mahmoud Abbas has backed calls by Hamas for an end to the economic blockade of the Gaza Strip as a condition for a ceasefire. At least 649 Palestinians and 31 Israelis have been killed in the past 15 days of fighting, officials say. 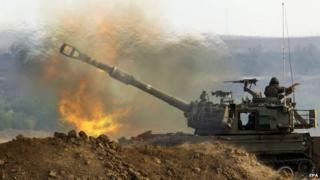 Israel launched its offensive on 8 July with the declared objective of stopping rocket fire from Gaza. US Secretary of State John Kerry arrived in Israel on Wednesday to try to help negotiate a truce. He landed at Ben Gurion airport near Tel Aviv, despite a 24-hour ban on US flights there imposed by American aviation authorities. Several European airlines have also suspended flights to Israel after a rocket from Gaza landed near the airport. Fighting continued overnight on Tuesday. An air strike in Khan Younis in the southern Gaza Strip left at least five people dead. An Israeli soldier was also killed. A Palestinian woman whom the BBC filmed being pulled from the rubble of a Gaza blast on Sunday also died from her injuries, her doctor said. Ten of her relatives were killed in the blast. UN chief Ban Ki-moon and Mr Kerry are both in the region to try to bring an end to the fighting. They have both called for an immediate end to hostilities and for the underlying causes of the conflict to be addressed. Earlier, Israeli Prime Minister Benjamin Netanyahu said Hamas should be held accountable for rejecting an Egyptian ceasefire proposal. Hamas, which is dominant in Gaza, says it will not agree to a ceasefire that does not allow for freer movement of goods and people across its borders. Rami Hamdallah, the prime minister of the new unity government backed by Hamas and Fatah, said it was time to end what he said was the cycle of unrelenting suffering for the Palestinians. "We demand justice for our people, who everyday and since the beginning of the Israeli occupation have been subject to the occupation for 47 years," he said. "It's time for this aggression to stop and it's time for this siege to stop." Mr Abbas, a co-founder of Fatah, also chairs the Palestine Liberation Organisation, an umbrella group which has endorsed Hamas's ceasefire demands. Israel imposed restrictions on the Gaza Strip in 2006 after Hamas abducted Israeli soldier Gilad Shalit. The measures were tightened by Israel and Egypt in 2007 after Hamas ousted rival Fatah and forcibly took control in Gaza after winning elections the year before. Hamas and Fatah announced a reconciliation deal in April, but the move was condemned by Israel which regards Hamas as a terrorist group. Gaza's health ministry said 649 Palestinians had been killed since the fighting began on 8 July. Authorities also said that the number of injured had passed 4,000 for the first time since the fighting began. The majority of Palestinians killed have been civilians, including dozens of children, according to the UN. UN human rights commissioner Navi Pillay said Israel's action in Gaza "belies the claims that all necessary precautions are being taken to protect civilian lives". There was a "strong possibility" Israel was violating international law, Ms Pillay said, adding that she also condemned "indiscriminate attacks on civilian areas" by Hamas. The IDF says it has killed more than 200 militants and destroyed 5,000 missiles. It estimates that Hamas has about 4,000 missiles left. Israel says 29 of its soldiers and two Israeli civilians have been killed over the past two weeks. The UN relief agency UNRWA said more than 118,300 Palestinians had now taken refuge in its shelters. It said 43% of Gaza had been affected by evacuation warnings or declared no-go zones. One Palestinian was also killed during a protest against Israeli troops in the West Bank town of Bethlehem. Eyewitnesses said that 32-year old Mahmud al-Hamamra was shot from a passing vehicle. Two Israelis were injured when a rocket fired from Gaza exploded near Israel's main international airport, Ben Gurion. Several American and European airlines cancelled flights to the airport after the attack, with one Delta airlines jet turning around mid-flight. Israel's transportation ministry said that the decision "handed terror a prize", and Benjamin Netanyahu asked the US to reconsider the suspension. Airlines that did not wish to land at Ben Gurion airport could land at Ovda airport in the south-east of the country, the ministry added. Earlier, John Kerry said a recent Egyptian truce plan should form the basis of a ceasefire. Speaking in Egypt, Mr Kerry said the US was concerned about Palestinian casualties, but lent his support to Israel's "appropriate and legitimate" military operation. He also said the US was sending $47m (£28m) in aid to Gaza "to alleviate the immediate humanitarian crisis". Israel launched its ground operation in Gaza after days of air strikes, following rocket fire by militants into Israeli towns. It says the move is necessary to target Hamas' network of tunnels, which have been used by militants to infiltrate Israel and carry out attacks. Are you in Israel or Gaza? How has the violence affected you? You can email your experiences to haveyoursay@bbc.co.uk, using the subject line 'Israel Gaza'. Or send us your experiences using the form below.